Asbestos mining existed more than 4,000 years ago, but large-scale mining began at the end of the 19th century, when manufacturers and builders began using asbestos for its desirable physical properties. Some of those properties are sound absorption, average tensile strength, affordability, and resistance to fire, heat, and electricity. It was used in such applications as electrical insulation for hotplate wiring and in building insulation. When asbestos is used for its resistance to fire or heat, the fibers are often mixed with cement or woven into fabric or mats. These desirable properties made asbestos very widely used. 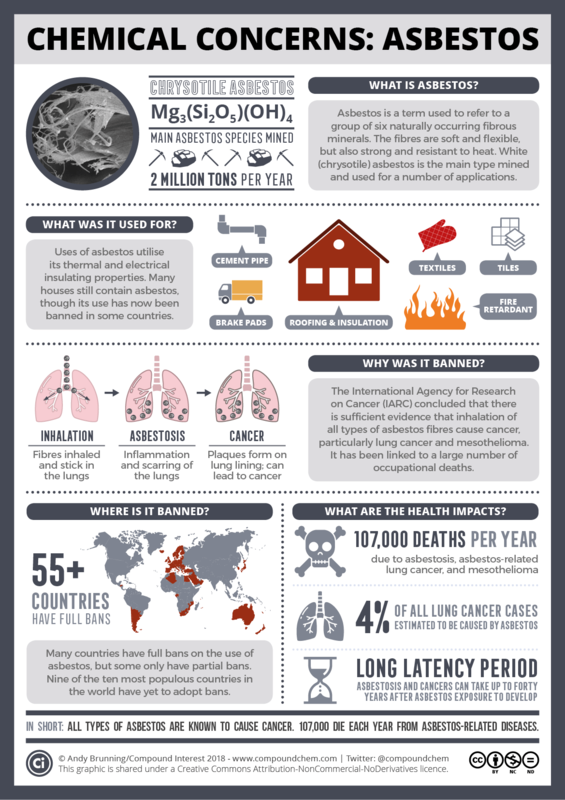 Asbestos use continued to grow through most of the 20th century until public knowledge of the health hazards of asbestos dust led to its outlawing by courts and legislatures in mainstream construction and fireproofing in most countries. Many countries have discontinued these uses since the health risks of asbestos became apparent. However, their legacy is that many buildings more than 20 years old contain asbestos. It’s estimated that 94% of hospitals in London contain asbestos, and it can also be found in older homes. It does not pose a danger unless disturbed, but can be costly to remove. The excellent Compound Chem website has a graphic as below explaining the dangers of Asbestos in simple terms. Click on it to enlarge.